Welcome to the seventh edition of MAMA Boards, an AppsFlyer video project featuring leading mobile marketing experts on camera. For today’s mini whiteboard master class, we have Ira Krachanovskaya, Head of Growth Marketing at Badoo, one of the world’s largest dating apps with over 360 million users. 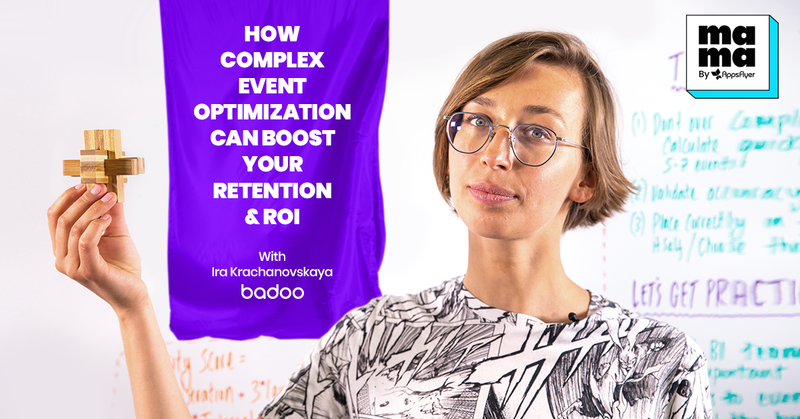 Ira explains the challenges of standard event optimization with ad networks (primarily, that either revenue OR ROI can be optimized at a given time), then presents Badoo’s self-created activity score, the solution for complex event optimization. In the end, she offers 10 practical steps for getting started with activity score and optimizing all metrics which are important to your marketing goals. Real experts, real growth. That’s our motto. Click the image above for a high-resolution version in a new tab. Hello, everyone, and welcome to another edition of MAMA Boards by AppsFlyer. My name is Ira and I work for Badoo. We are one of the biggest dating apps in the world and have over 360 million users. On a daily basis, we have over 40K registrations, which is why we need to be very smart with optimization, how we bring those users, and what those users do for us. 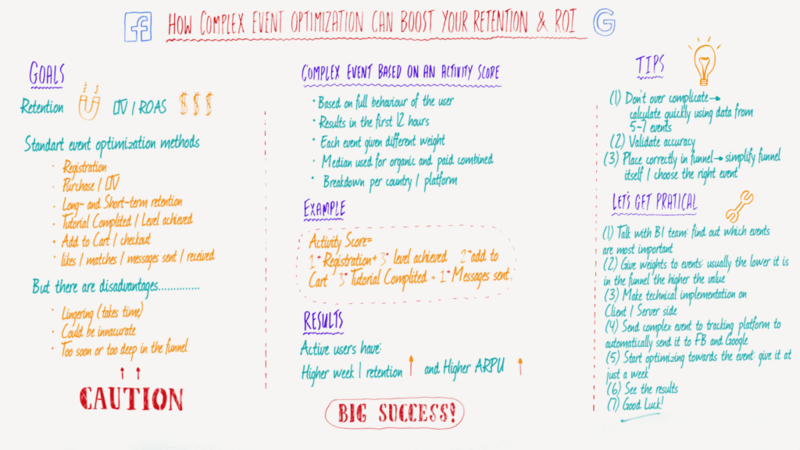 Today, I would like to talk about how complex event optimization can boost your retention and your ROI. We will cover why we came up with this approach, what we actually got in the end, and some tips for you if you will decide to implement this idea. What are the standard events typically optimized? Facebook and Google are two major traffic platforms where you can get traffic. That’s why it’s important to put in the work with them on all steps. Often, marketers have two main goals on their backend: user retention and the revenue that they get from those users. Optimization on Facebook and Google is usually done such that you can only optimize towards one event. This is the main disadvantage for us as marketers, because we are looking for two of those metrics. Usually, we can choose from Registration, Purchase, Retention, and [others which are vertical-specific]. If you’re a gaming app, you could go for Level Achieved, Tutorial Completed. If you’re an e-commerce app, you choose Add to Cart, Checkout. If you’re a dating app like us, you could go for Likes, Matches, Messages Received, any event that is relevant to you on your side. What are the disadvantages of standard event optimization? And yet, there are some disadvantages to this optimization. First, it takes time. For example, if you optimized towards long-term retention and you need to wait up to 14 days in the decision making process, this is a disadvantage for both users and marketers, because you come to the office, you work to make your campaigns effective, and you ultimately have to wait and perhaps lose money. Second, it can be inaccurate. If you optimized towards LTV and it’s one of your projections, you will again need to wait for the most accurate data. In our case, we can go up to seven days to retrieve the most accurate data for our LTV projections for the following year. Last but not least, some events can be placed too soon or too deep in the funnel. For example, registration is one event that occurs too soon in the funnel. Since around 80% of your installs will have users registering, this metric won’t tell you if the user will be retained or if the user convert to paying. What is complex event optimization based on activity score? So, with this in mind, we come to complex event optimization. This actually occurred because we shared our concerns with our data analyst team, who, in the end, came up with a user-level activity score which is based on user behavior occurring within the first 12 hours. Activity score combines several events, as I have just said. It’s a faster metric to calculate and use because you can get the results within the first 12 hours. The idea is that you take certain sub-events and weigh them based on how engaging each event is for the user. You use the median at the benchmark for your combined organic and paid users. So, if the user is above the median, then it’s an active user and you optimize towards those campaigns where you have the biggest percentage of active users. For our own optimization, we have also done a breakdown per country and platform because we see different behaviors there. This is an example for you of how your activity score can look. On our side, we use different events which we believe, for us, are the most important. 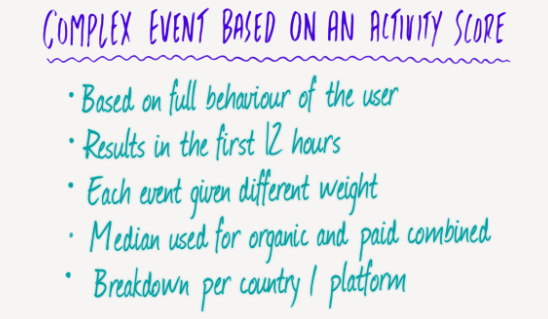 Here, you need to think of which events you would like to measure, and which events make your users most engaged with your app. We came up with our activity score last year and tested for the first time in November. Even back then, we could already see that active users have higher week 1 retention and higher ARPU, which are the two most frequent metrics measured by advertisers. So, if you will decide to implement this, I would like to share with you some tips and how you could actually get practical on your side. 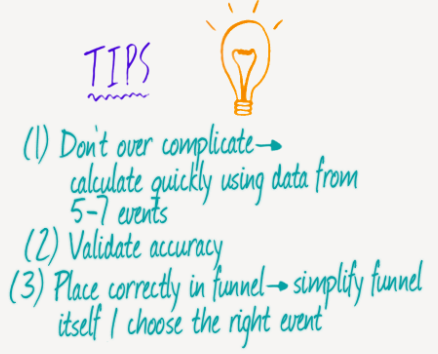 First, don’t overcomplicate your complex events. Try to use a maximum of 5-7 sub events because, as you might remember, the first disadvantage is that these events are lingering. Try to select only those events that you would be able to make a decision about within the first 12 hours. So, you begin to get a sense of your activity score. Second, validate the accuracy. When you are in the implementation stage with your tech team on either the client or server side, make sure the work is in accordance with what was done by your data analyst team. You have the same naming, calculation, all the conventions are there. Third, place the complex event correctly in the funnel. What we do on our side is that we simply find the funnel itself on Google and Facebook. On Google, we send one event per ad account and on Facebook, instead of, let’s say, up to 8 – 10 standard events, we only send 2 events currently. We send registration, we send the complex event, and we send the furthest event that we have on our funnel, which is a purchase. Alright, I’m interested. How do I get started? Okay guys, let’s get practical. I would like to share with you the additional steps that we have taken to optimize complex events and that you could implement on your side. First, talk with your BI team, share your concerns, try to find the events that are important for you. Second, give weight to those events based on how engaging they are for your users. Third, make technical implementations on the client or service side. Fourth, send your complex event to the tracking platform you use and map it with Facebook and Google. It will make it easy, fast, and accurate if you work through one platform and then send it to any tracking source you have. Fifth, start optimizing toward this event. Test different campaigns and give it some time, feed the algorithms with the events – the more events you send, the better. Sixth, see the results. If the results are positive, go on with this score. If not, try to rethink your formula – maybe you need to change some events or the weight you have for each of them. Finally, I would really like to thank our data analyst team who actually came up with the activity score metric. If you have any questions or comments, please leave them below. If you would like to watch other MAMA Boards, please use the URL below.